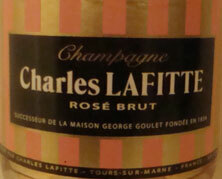 Champagne Charles Lafitte is the successor of Champagne George Goulet which was founded in 1834. They are now a brand owned by Vranken-Pommery along with Cuvée Diamant, Demoiselle, Heidsieck & Co Monopole, Pommery, and Vranken brands of champagne. Vranken-Pommery's claim to fame, and their reason for their success and rapid growth, is they grew via selling Champagnes at grocery stores, making them easily more available to a wider audience. This is a market that their competitors historically avoided. Champagne Mercier is also another supermarket Champagne, the most popular Champagne in all of France in fact, and not imported to the USA or much of anywhere else. Charles Lafitte has several different bottlings, including a basic NV, a Blanc de Noirs (67% Pinot Noir and 33% Pinot Meunier) a Demi-Sec (40% Chardonnay 30%, Pinot Noir and 30% Pinot Meunier), a Rose (40% Chardonnay, 30% Pinot Noir 30% and Pinot Meunier, with 16% still red wine from Bouzy added) and a vintage wine as well. Reviews range from "Really good basic fizz" to "cheap and nasty" My one experience is below and was favorable. Not fantastic, but at US$25 a good deal for a Rose and fun to drink. Charles Lafitte Champagne Non Vintage - A cheap supermarket brand that doesn't get great reviews. Light to medium copper color and a deal at $25. On the palate, a warm mineral bath with fruit undertones. Nice texture and mouthfeel. Fairly simple yet very nice. More about minerality than fruits for certain. For some unknown reason I want to swig it from the bottle and say "Yo Ho Ho and a bottle of Rum" - maybe the marine seaspray quality to the nose, or the infamous pirates and smugglers Pierre and Jean Lafitte? In any case if looking for a decent and cheap Rose I'll keep Charles Lafitte in mind.